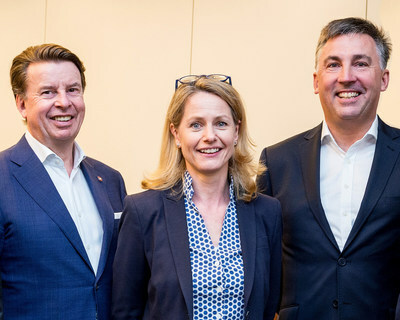 FRANKFURT, Germany, Oct. 4, 2018 /CNW/ -- Fleming's Hotels, a modern leader in the business & leisure hospitality marketplace in Germany, has selected Cendyn, the leading hotel sales and CRM provider, as the group's CRM technology partner. The Fleming's brand is a modern, innovative hotel brand in Germany. Each property within the group prides themselves on their perfect symbiosis between international standards and local charm. Guests at the Fleming's Hotels can look forward to a combination of experience, quality and passion. Both business travelers with high standards looking for an elegant venue for their meetings and leisure guests can benefit from the classic "Fleming's" atmosphere and the charming distinction. Cendyn will implement a state-of-the-art solution that will collect data from multiple property systems to provide real-time personalized communications and guest intelligence at 20 hotels across Germany, Austria and Switzerland within the Fleming's Hotel portfolio. Hartmut Schröder, CEO Fleming's said "By choosing Cendyn as our CRM platform, we plan to take our communication, personalization and data security efforts to the next level. Cendyn will provide us with a platform that enables us to drive loyalty and retention across our portfolio of hotels, whilst ensuring that our data is managed and utilized in a secure and compliant way." Cendyn's eInsight CRM provides a marketing automation and guest intelligence solution that can easily handl complex interfaces, drive loyalty and leverage real-time data to provide personalized one-to-one communications for every guest, no matter what channel they came through. Business rules-based automation combined with dynamic personalization and upsell opportunities drive revenue through multiple channels and will help Fleming's Hotels acquire new customers as well as drive loyalty with existing guests. "We are thrilled to be partnering with Fleming's Hotels. Working with a group of hotels in Germany with such well-renowned heritage and stature is a true honor," said John Seaton, Managing Director, EMEA & APAC, of Cendyn. "Their decision to embrace CRM and the technology enhancements that Fleming's Hotels will see with this adoption is a testament to their commitment to their guests and their desire to stay ahead of the trends in technological advancements. We look forward to helping Fleming's Hotels continue to drive profitable revenue growth, guest satisfaction and loyalty." Fleming's Hotel Management und Servicegesellschaft mbH & Co. KG, with its headquarters in Frankfurt am Main, was founded in 1990. Altogether, the portfolio includes 20 accommodation establishments: Ten four- to five-star hotels of the Fleming's Hotels & Restaurants brand in Frankfurt, Munich, Vienna and Zurich, and soon a new hotel in Hamburg. Furthermore, Fleming's GmbH & Co. KG operates the Savigny Hotel Frankfurt City, franchise enterprises with Deutsche Hospitality and the IntercityHotel GmbH, as well as three boarding houses of the "LiV'iN Residence by Fleming's" brand. Fleming's GmbH operates in Germany, Austria and Switzerland and employs around 650 employees.